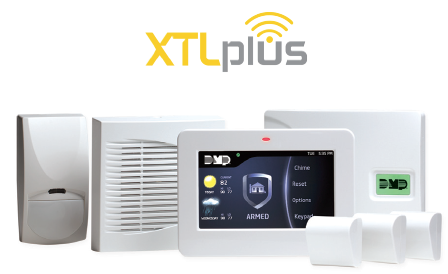 XTL Plus infographic from DMP Alarms on Vimeo. The XTLplus wireless burglary control panel sets a new standard for fast installation, reliable security, and ease of operation. In a single small footprint, the XTLplus includes all the features and benefits of a residential or small commercial panel — 99 zones of 900 Mhz Two-Way Wireless, cellular AND Wi-Fi communication, as well as Z-Wave Plus™ — all in one panel. For customers who want the convenience and power of mobile control via the Virtual Keypad™ app, Wi-Fi is a great option plus cellular as a backup communication to the monitoring center. The XTLplus can be equipped with a 265C for cellular communications or Wi-Fi on board to meet the growing demand for additional lifestyle features like lights, locks, and thermostats. The Virtual Keypad™ app works on smartphones or mobile devices and allows users to access a number of system functions. Controls include arming/disarming, Z-Wave Plus, and Camera control. MyVirtualKeypad.com also allows users to access their security systems on a tablet or desktop computer. MyAccess™ lets them send commands to the system via simple text message, allowing any text-capable phone or mobile device to become a remote control. The 9800 Wireless Graphic Touchscreen Keypad provides users with an easy-to-use, intuitive keypad that blends with any décor. All system features and functions can be accessed via the carousel menu on the large, 5-inch, full-color touchscreen. The fully functional keypad includes a proximity reader option for codeless arming/disarming. Home automation Z-Wave Plus features may also be controlled via the touchscreen keypads.